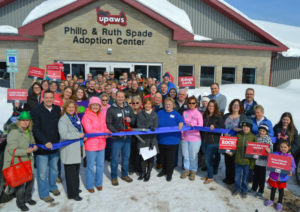 GWINN- The Lake Superior Community Partnership (LSCP), Greater Ishpeming Negaunee Chamber of Commerce (GINCC) and Marquette Chamber of Commerce recently assisted UPAWS with a ribbon cutting to celebrate the grand opening of their new facility in Gwinn. UPAWS is a local non-profit organization that cares for homeless, unwanted, abandoned and abused domestic animals. They advocate for animals in their care to help them find their forever home. Their mission is to improve the quality of life and welfare for domestic animals and to provide a safe haven while finding lifelong homes for the animals in our care. They embrace the No Kill philosophy, seeking to end the euthanasia of healthy and treatable animals. The new animal shelter is approximately four times larger, the animal shelter completely realigns dog kennels and cat areas, a dedicated space for small critters, and a fully functional pole barn for the rescue of large and farm animals, particularly horses. The community center aspect includes a community education room, fenced-in year round dog park, and private spaces for adoption counseling or to surrender an animal. UPAWS is now located at 815 S. State Highway in Gwinn. They are open Monday-Wednesday from 12:00 p.m. – 4:00 p.m., Thursday from 12:00 pm. – 6:30 p.m. and Friday-Sunday from 12:00 p.m. – 4:00 p.m. For more information you can visit their website www.upaws.org at or call (906) 475-6661. 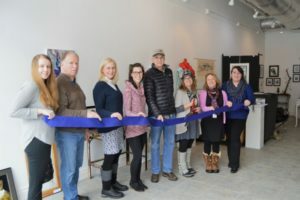 MARQUETTE- The Lake Superior Community Partnership (LSCP) recently assisted the Marquette Artist Collective with a ribbon cutting to celebrate the opening of their art gallery. The Marquette Artists Collective strives to support artist and the arts in our community. Joy Bender-Hadley was inspired around the time of the August 2017 solar eclipse to create an artist collective. Since then this dynamic group of visual artists has been growing, creating and organizing. They currently have 15 Active Artist Members with a growing number of Supporting Artist Members. They have curated many different exhibits in different venues around Marquette and have several others planned for 2019. The Active Artist Members recently voted to open an art gallery at 130 W. Washington Street, the former home to the Oasis Gallery. It is known as The Gallery: A Marquette Artist Collective Project. The Gallery is divided between two spaces; a space for rotation exhibits and a space where Active Artist Members of the Marquette Artist Collected can sell their work. Please visit www.facebook.com/mqtartistcollective/ for most recent information. They are open Tuesday from 11:00 a.m. – 3:00 p.m., Wednesday from 12:00 p.m. – 6:00 p.m., Thursday from 11:00 a.m. – 4:00 p.m., Friday from 10:00 a.m. – 2:00 p.m. and Saturday from 12:00 p.m. – 2:00 p.m.
Pictured from left to right: Sara Sands, LSCP Business Development Representative, Dave Campana, Marquette City Commission, Susan Estler, Artist Collective Member, Dyana Nefe, Artist Collective Treasurer, Mayor Fred Stonehouse, Joy Bender-Hadley, Artist Collective President and Founder, Tiina Harris, Marquette Arts & Culture Center Manager and Brooke Quinn, LSCP Business Development Representative. 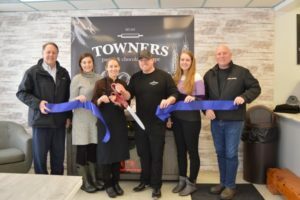 GWINN- The Lake Superior Community Partnership (LSCP) recently assisted Towner’s Pastry and Chocolate Shoppe with a ribbon cutting to celebrate the opening of their store in Gwinn. Towner’s Pastry and Chocolate Shoppe works with local suppliers to source the freshest authentic ingredients and use old fashioned techniques to ensure the highest quality. They create savory crepes and sweet treats like cinnamon rolls, financiers, croissants, baked oats and more! Complement your coffee, tea or cocoa with one of these handcrafted goodies. Towner’s Pastry and Chocolate Shoppe is located at 37 W. State Highway M35 in Gwinn. They are open Tuesday-Friday from 5:30 a.m. – 1:30 p.m. and Saturday and Sunday from 8:00 a.m. – 2:00 p.m. They also have a convenient drive-thru for on the go needs. For more information you can visit their website at www.townerspastryshoppe.com or call (906) 372-4004. Pictured from left to right: Keith Moyle, Marquette County Ambassador, Emily Tardiff, LSCP Marketing Coordinator, Katie Bonzer, Owner, Jake Bonzer, Owner, Sara Sands, LSCP Business Development Representative and Joe Boogren, Forsyth Township Supervisor. 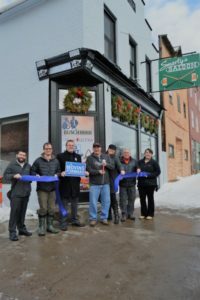 NEGAUNEE- The Lake Superior Community Partnership (LSCP) recently assisted Smarty’s Saloon with a ribbon cutting to show-off their new façade in downtown Negaunee. Smarty’s Saloon worked closely with the City of Negaunee to apply for funding for exterior improvements through the Community Development Block Grant program accessible through the Michigan Economic Development Corporation (MEDC). They provided a match to these funds and leveraged their private investment and the traditional downtown design in their plans to restore the building and increase visibility. This redevelopment will be a significant asset to downtown economic activity, and will definitely improve the pedestrian and customer experience. Early on in the process, the Central Upper Peninsula Planning and Development Regional Commission (CUPPAD) assisted the City of Negaunee with drafting and submitting the application for Smarty’s façade grant funding through the CDBG program. Following the award, CUPPAD was contracted to be the City’s grant administrator, which entailed activities like assisting the City on compliance with Federal regulations, submitting payments and reports to the MEDC, and coordinating payment requests with contractors and architects. Smarty’s Saloon is a pub located at 212 Iron Street in Negaunee. They are open seven days a week from 12 p.m. – 2:00 a.m. For more information you can follow them on Facebook or call 906.401.0438. Pictured from left to right: Ryan Soucy, CUPPAD, David Nelson, City of Negaunee, Nate Heffron, Negaunee City Manager, Scott Soeltner, Owner, Jen Tucker, MEDC, Paul Wolfson, Marquette County Ambassador and Brooke Quinn, LSCP Business Development Representative.